Direct from Buenos Aires, Argentina's elite touring ensemble Tango Desire proudly announces its latest impassioned show "The Rhythm of the Night", with six couples and on-stage musicians conjuring the world of 1950s Argentina, featuring music, singing and the seductive, passionate dancing of authentic Argentinean Tango. Since 2004 Tango Desire has made their home at the prestigious Zanjón de Granados in Buenos Aires. They have danced nearly 1000 shows throughout the country, including at Argentina’s top venues such as the Astral, Metropolitan and Margarita Xirgu Theatres, and the Buenos Aires House of Culture, presenting shows of the highest caliber to a discerning and loyal audience. Distinguished guests at their performances have included former British Prime Minister Tony Blair, the President of Columbia, and a visiting delegation from the United Nations. 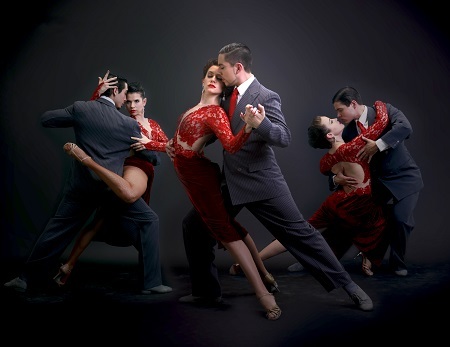 Tours have taken Tango Desire’s dancers all over the world, including to Europe, the Middle East, the US, South America and Asia, including multiple extensive tours to China. Celebrating their 15th anniversary in 2017, Tango Desire boasts a staff of young but internationally experienced dancers, singers and musicians, performing traditional and modern tango to the music of Astor Piazzolla and others. Their authentic productions respect the genre's essence and elegance with a striking, modern rhythm and style, and have a wide appeal, drawing in even those unfamiliar with tango and stirring the passions of audiences around the world. The ensemble is known for its versatility, technical excellence, sensuality and passion. THE RHYTHM OF THE NIGHT’s cast includes Tango Desire director/choreographers Fernanda Grosso and Alejandro Ferreyra with 10 other world-class dancers, two singers and an onstage orchestra of the best tango musicians in Buenos Aires.